You might be starting to see a trend here that I love Italian food and seem to be able to eat it anytime I get the opportunity. Mangia is more of an intimate restaurant that offers the feel of both casual and slightly upper scale dining combined into one. I had some of the best eggplant Parmesan here and you might also be noticing another trend, that I really enjoy eggplant. The eggplant was sliced into thick rounds and unlike most eggplant Parmesans the breading did not become soggy from all the moisture in the eggplant. That right there alone was a huge success to me. In addition, the eggplant Parmesan was served with pasta in a marinara sauce along with broccoli and cauliflower. Yes, that's right you heard me correctly they even served up veggies with this meal. Mm writing this is already making me want this dish again. My partner in crime had the goat cheese raviolis, which I heard were quite delicious too. As you have probably guessed this restaurant was a success and gets another thumbs up from me. After this meal it was decided that I had to try Ted Drewes. 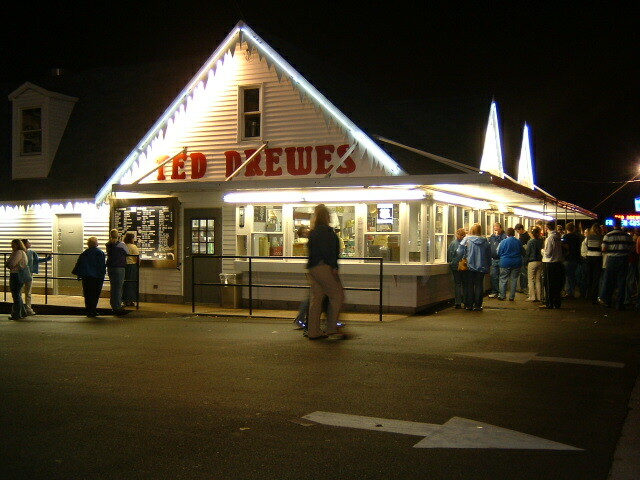 Ted Drewes is a St. Louis institution and definitely on my St. Louis to-do list. In the summertime swarms of people crowd around the place to get their concretes and by winter the stand becomes a place where you can buy Christmas trees, get warm drinks, and yes still get the famous frozen custard. What makes Ted Drewes so unique is that they don't serve ice cream they serve frozen custard, which is what I would call a richer version of ice cream and very tasty. They are also famous for what is called a concrete. The easiest way to describe it is that it is like a Blizzard from Dairy Queen, except 10 times better, yes definitely 10 times better. I tried the concrete called Cardinal Sin. This consisted of chocolate and cherries mixed into the frozen custard. Mm, so good. My partner in crime had the Dottie which consisted of mint, chocolate, and macadamia nuts mixed into the frozen custard, which I tasted and it was so good that I might have to get it next time. So yes it was probably 40 degrees outside and I won't even get into what the wind chill most likely was, but we stood in line (yes there were many others as crazy as us out for some Ted Drewes) and then ran back to the car to eat it with the heater on and I enjoyed every bit of it.